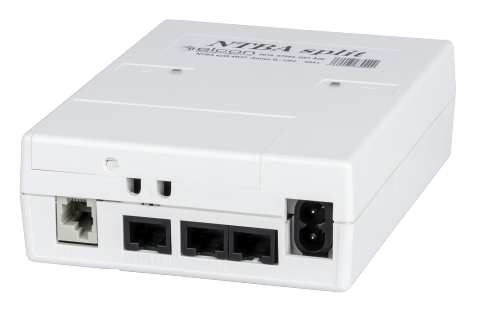 The NTBA split connects ISDN customer premises equipment to the public ISDN network. Additionally, the NTBA split separates the ISDN signal from ADSL signal allowing the transmission of both signals via ISDN UK0 port. That enables subscribers to digitally transmit voice and data over the ISDN access line, and to connect the ADSL modem directly to the NTBA split. The ISDN access line is linked via ISDN UK0 port. Two ISDN S0 ports are available to connect up to 8 terminal units, e.g. ISDN telephones or ISDN PC cards. The U-R2 port is available for an ADSL modem.